SAN FRANCISCO -- Agnes Bernstein, above, knows how well socialism works, or more precisely, doesn't work. The eight-year resident of the San Francisco bay area grew up in Poland under socialist rule, and told a crowd of hundreds at a tax day rally here on Wednesday that she fears the United States is now heading in that direction. "The government is growing too big," Bernstein said in an interview with CBS News after her speech. "And I grew up in socialism and I've seen it. And this is reminding me more and more of what Poland used to be. I was fortunate to see the transfer from socialism to a free market economy in Poland and i'm very sad to see that the opposite is happening here." 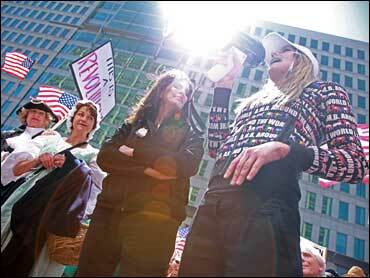 The San Francisco rally convened in front of House Speaker Nancy Pelosi's office in the federal building here, where speakers denounced Wall Street bailouts, the federal income tax, and members of Congress of both major parties they accused of being out of touch with the rest of the country. 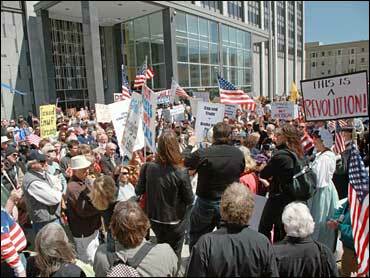 The San Francisco rally was non-partisan: it attracted Democrats, Republicans, Libertarians, Greens, and independents, many of whom appeared to be supporters of Texas Rep. Ron Paul's 2008 presidential bid. Call them members of the nascent Leave Us Alone Party, or No More Bailouts Party. 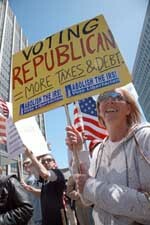 The front of one protester's sign said "Voting Republican = More Taxes & Debt." The other side said the same thing about Democrats.